Here are some craft room ideas to make your space really special for you to make your own brand of magic !! In a dream world we could all have a fully equipped and fitted craft room of our own, a special place to retreat to and make cards to our hearts content. A room that had a place for every thing and everything was in it's place when we had finished with our creations. No glitter or bits lying around, just everything magically cleared away! I made cards for a long time on my dining room table, and whenever any body came for a meal I had to find somewhere to store it all out of the way. Then once they had gone I had to lay it all out again to continue with whatever project I was working on. It all got a bit chaotic and confusing. But now I am very lucky to have a room just for my own use. This is how my craft room started out. A dismal wasted space that never saw the light of day, and was so full of dust. How many times do you tell your self that story? 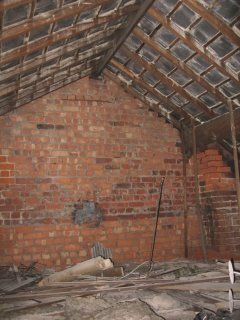 Have a look at the before and after videos and see what I planned out for my special space. I had lots of craft room ideas I wanted to put in place. 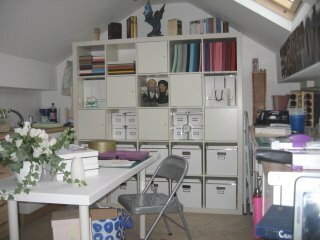 The space has been made into a workable area, and it is bright, light and airy and a real pleasure to work in, and I can put together some of my craft room ideas. The room has been divided into separate areas for each task I may want to do. Around the perimeter the kitchen cabinets provide the storage, and the counter height work tops are in a butchers block. No space is wasted and above the units are wall mounted racks with containers fitted to them for holding all the tools I need regularly when I am working. This height is suitable for all the things you need to do while standing. It is easier for me to cut, fold, die cut or iron while standing. In the corner to the left is a sink unit with hot and cold water which saves endless trips up and down the stairs. There is also a special area, with a light box, for me to photograph the cards I make for the website. In the centre of the room I have another table height area where I can sit and colour or put together the sketches I may need. Boxes on the table hold all my pens and this is one of the craft room ideas from Ikea. The table can be used for sewing, studying or any other jobs where I feel more comfortable being seated. The large area at the back is for me to store all my essential paper and card stock. I try to keep most of it stored inside the cupboards to keep it clean. The larger boxes on the unit store all my flowers and ribbons, envelopes and CD's. All neatly hidden out of the way. Under the counter top to the right is a set of drawers. All have small storage baskets placed inside which will hold all my favorite adhesives. They where very cheap ...about £1.50 for five from Morrisons supermarket. The foam pads, shaker tapes, gel glues and double sided tapes are all kept neatly in their place and ready for me to use. As the room progress and I get more accustomed to the space, I am sure it will change and become a more workable area for me. At the moment it will be trial and error until I see what is the best way to utilise the space and where to add in more of my craft room ideas. Maybe you have a spare room or some loft space that you could make your own. It doesn't have to cost a fortune to kit it out, and your own craft room ideas can be incorporated into the space. Most of my storage is from Ikea which has a wealth of items to incorporate into your space. As long as the light is good and it is warm enough for you to work in, then the space can be adapted to suit your needs. Measure the area and plan out what you will need. Wall cupboards in which to store your smaller items, and some drawers for papers or equipment that will be close to hand. Add a work top that is large enough for you to place your die cutter, sewing machine or scoreboard. But even if it is just the corner of the room and a cupboard for your stash we all need to think about ways to store it properly. So lets take a look at some crafters storage ideas.